Intricate in design and function, the hand is an amazing work of anatomy. Form follows function in the hand; therefore, any injury to the underlying structures of the hand carries the potential for serious handicap. To reduce the risk of hand injuries, even the smallest hand injuries require a good medical evaluation. The goal with injuries to the hand is a rapid and accurate initial evaluation. In other words, once an injury occurs, the doctor strives to begin medical treatment quickly so the short- and long-term effects can be minimized. The hand consists of 27 bones when the 8 bones of the wrist are included. When the other associated structures (nerves, arteries, veins, muscles, tendons, ligaments, and joint cartilage) are considered, the potential for a variety of injuries exists when trauma involves the hand. Hand injuries in sport are common and largely unavoidable because athletes from most sports rarely think about damaging their hands. Hand injuries occur in nearly every sport from cycling to boxing and even soccer, requiring effective sports medicine techniques to repair. The hand is made up of many bones, ligaments and muscles meaning that a variety of different sports injuries can be picked up. Sometimes doctors can diagnose a hand injury by examining the hand. A local anesthetic may be given before the examination, which otherwise might be too painful. However, x-rays may be needed to determine whether the joint is unstable and to detect fractures. Occasionally, computed tomography (CT) or magnetic resonance imaging (MRI) is needed. 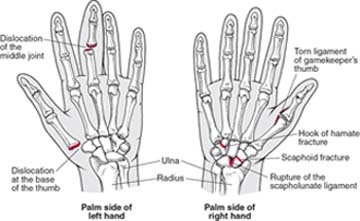 Often, an untreated injury can result in a permanent deformity of the hand. Therefore, an injured hand should be immobilized so that it can heal normally. A bandage, splint, or cast may be used, depending on the injury. 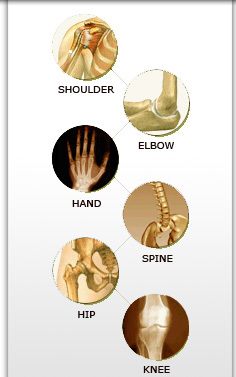 Surgery is sometimes necessary if bones are out of position or a joint is unstable. Hand exercises are begun as soon as possible to prevent loss of function.